Deborah Underwood was recently out on the book tour trail, sharing her new BEARNARD’S BOOK with readers across the nation. And they loved him—and his sidekick, Gertie the goose, as well. Soon, Gertie will get her own story—and Bearnard will write it! If only Bearnard and Gertie could agree on what kind of story it should be…. 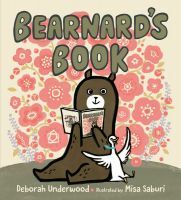 BEARNARD WRITES A BOOK is now underway, again with the talented Misa Saburi illustrating and again with Laura Godwin Books, and it will be out in spring 2021, which will be upon us before we know it!